Businesses today are taking basic services and turning them into well-designed, convenient user-friendly experiences. You see it every day with companies like Spotify and Seamless. Or Netflix, which is suggesting I watch The Great British Baking Show, based on my family’s viewing-history. Now, imagine the possibilities if we applied this business model to sustainability. The Supply Chain Solutions Center does just that. Launched today in partnership with over 10 leading environmental NGOs, this innovative platform puts resources and expert advice at the fingertips of sustainability professionals. In other words, finding sustainability solutions is suddenly as easy as finding a song on Spotify. Because, considering what’s at stake…shouldn’t it be? The modern global supply chain is enormous. It is responsible for over 60 percent of greenhouse gas (GHG) emissions, two-thirds of tropical deforestation and 80 percent of all water use. And, according to recent reports, such as the Intergovernmental Panel on Climate Change (IPCC), which was written and edited by 91 scientists from 40 countries, our time to act is running out. Until now, however, there’s been a vital gap in sustainability departments’ capacity to stay informed on the latest resources to address environmental impacts across global supply chains. The Supply Chain Solutions Center is here to fill that gap by connecting sustainability experts to exactly what they’re looking for. Help companies who are beginning their sustainability journey. In the over 20 years I’ve been doing this, my team and I often encounter business professionals who have been given the task of making their company more sustainable as a side project, and therefore are strapped for time and resources. Sustainability might never have been part of their company’s business plan, but it is now because of the serious risk to company supply chains and demand from consumers, investors and even employees. These professionals have a steep learning curve ahead of him and need help navigating their complex supply chains. Inspire the companies that are already acting to go bigger, faster. My team also encounters professionals who are often engraining sustainability in the core of their business. Reducing the impacts of their company’s supply chain has proven to be good for business – it has reduced risk and environmental impact, and possibly even boosted profits. Or, perhaps they’re one of the more than 4,800 companies that in 2017 reported emissions reductions amounting to 551 million metric tons of carbon dioxide, which translates into $14 billion in cost savings. They’re one of the nearly 80 percent of consumer goods supply chain decision-makers who have established a sustainability plan for their supply chain. The problem is that only a tiny fraction of these companies – 8 percent have met their plans. I’d call these professionals the “middle-milers” – those hard working folks who are slogging through the arduous process of unraveling the complex, opaque mess that is the modern supply chain. We created the Supply Chain Solutions Center to help both of these professionals. The Netflix and Spotify models were the key – cut through the confusing complexity and bring solutions out into the open. 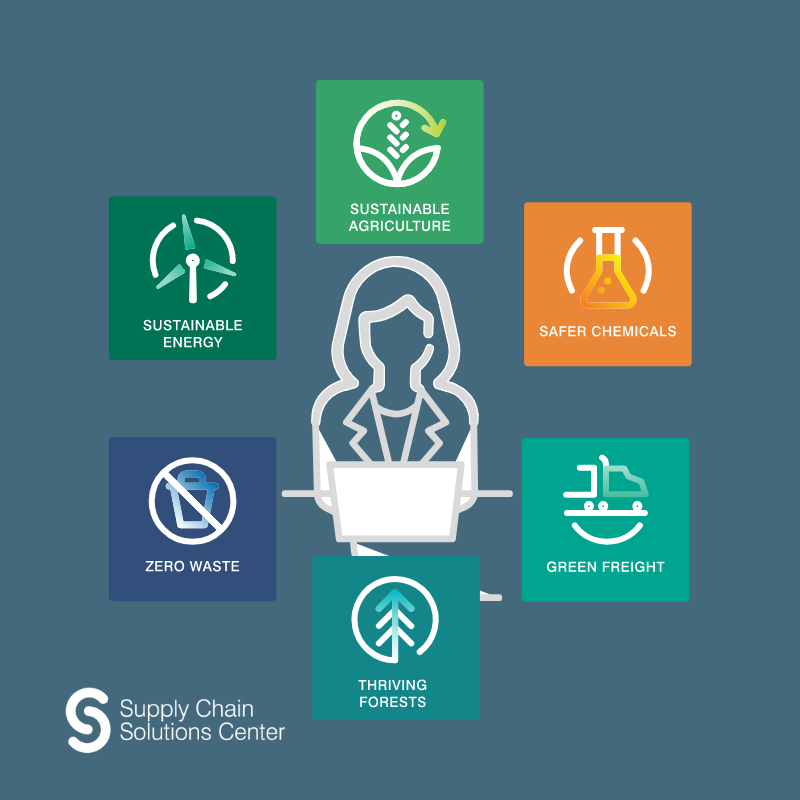 Since the Supply Chain Solutions Center is both searchable and “browse-able,” it gives business professionals at any level access to the latest expert resources available to help reduce their company’s climate and chemical footprints across global supply chains. Professionals can also take an assessment to evaluate their sustainability efforts to date in order to find out where their company stands on the sustainability “journey” – and thus prioritize actions accordingly. There are hundreds of sustainability resources available on the site that cover six areas: agriculture, energy, chemicals, waste, forests and freight. Users can create profiles, which enables them to find and save content specifically tailored to their needs. Netflix doesn’t offer movies from just one studio, and Spotify doesn’t promote just one record label. The Supply Chains Solutions Center is no different: perhaps what is most exciting to me about this new site is that it’s a product of collaboration. Leading NGOs, consultants and media platforms have enabled us to gather a diverse, wide-ranging array of resources – case studies, templates for building sustainability plans and opportunities for connecting with NGO experts – so that users of the site have a holistic view of available solutions. It’s a “digital village” down to its core, and I’m thrilled that these organizations – Conservation International, CDP, BSR, the Sustainable Packaging Coalition, The Sustainability Consortium, ReFED, Field to Market: The Alliance for Sustainable Agriculture, Sustainable Purchasing Leadership Council, Further with Food, Shelton Group and GreenBiz – are joining us on this incredible journey. We welcome other expert organizations to climb on board as well. I believe that there’s nothing out there that has the potential to help companies engaging on sustainability more than this. My team and I realize that the Supply Chain Solutions Center alone will not create change. It needs to be tied with drivers of change such as a demand signal from a retailer or customers. It needs people to act on the recommendations. But for anyone just getting started with their sustainability journey – or who is well along the path – the Supply Chain Solutions Center has the potential to be a game-changing resource. I encourage you to give it a test drive and create your sustainability playlist today!